Becoming a certified Yasodhara Yoga teacher starts with the Yoga Development Course (YDC), a three-month residential program at Yasodhara Ashram. The YDC is designed to give students an in-depth introduction to the major branches of yoga and a foundation in personal and spiritual development. In the teacher certificate programs, students go in-depth in their own work and develop their teaching skills. The first step is Hatha Yoga teacher certification. This can be followed by Hidden Language Hatha Yoga and Kundalini & Dream Yoga certification. The prerequisite for these certification courses is the completion of 30 book reports required post-YDC. 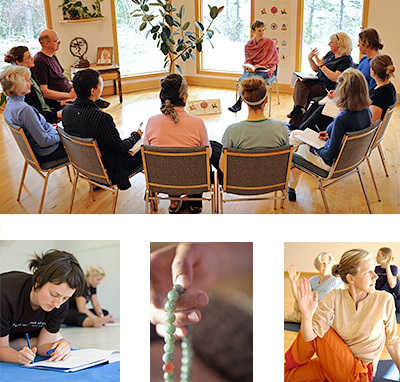 Yasodhara Ashram’s teacher certification programs are registered with Private Career Training Institutions Agency of British Columbia. The three-month YDC is the prerequisite for all of teacher training and certifications. Includes 675 hours of practice, study and instruction in the major branches of yoga. Following the YDC, a ten-day certification program to teach Hatha Yoga is offered. This course provides basic training in Hatha Yoga teaching, and helps to transform your personal learnings from the YDC into teachings you can share. Learn what it means to teach from your experience through the Yasodhara Yoga intensive fourteen-day Hidden Language training process, and gain greater appreciation of the body as a spiritual tool. Prerequisites: The Yoga Development Course, and the Hatha Yoga Teacher Certification. Completion of the YDC book report project is also a requirement. Delve deeply into the realms of mind and consciousness in a course as popular with experienced teachers as with those learning to teach for the first time. An intensive fourteen-day certification. Prerequisites: The YDC and completion of the YDC book report project.